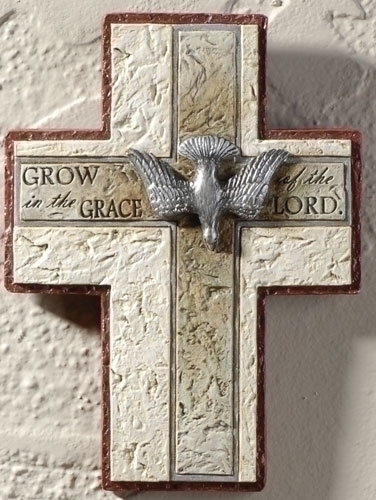 "Grow in the Grace of the Lord" inscribes this confirmation cross. A suitable gift for confirmation or RCIA as someone enters the church. There is a dark trim around the stone like finish with a silver descending dove. Made of a resin stone mix this cross measures 7" tall and 5.25" wide. A matching rosary box item # 31037. A companion to our popular communion cross #31087. Very lovely cross that was perfect for our Godsons confirmation.